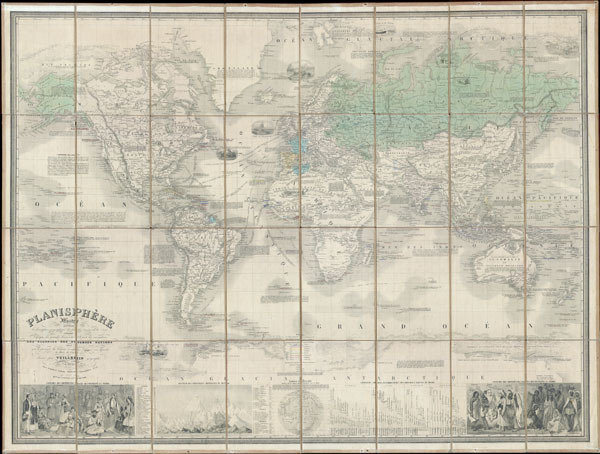 This is a rare and magnificent 1857 case map of the world on Mercator's projection by French cartographer Alexandre Vuillemin. Depicts the world in extraordinary detail with numerous decorative embellishments and prolific notations. Map offers nothing short of 11 decorative vignettes ranging from whaling ships at sea, to Eskimos hunting in the arctic, to armies of horsemen battling across the Sahara. In the American Northwest, some of Lewis and Clarks recent discovers are noted and there is some attempt to notate the various American Indian tribes of the region. The ice flows of both the arctic and Antarctic are decoratively and beautifully rendered in profile. Nautical routes between major cities are noted. There are also innumerable historical and textual notations throughout the map. Bottom portion of the map has two engravings depicting the traditional consumes of the various world cultures, as well as statistical information on the worlds rivers, mountains, and climate. All text is in French. A much smaller and edited down version of this map was published in Vuillemin'simportant Atlas Illustre de Geographie Commerciale et Industrielle. Edited by Fatout o Boulevard Poissoniere, no 17, Paris. Very good condition. Mounted on original linen in 32 folding sections.